The expedition will commence at the Anchorage International Airport at 2pm on Day 1. Depending on your flight itinerary, it may be necessary for you to fly to Anchorage the day before your start date in order to meet the group at 2pm on Day 1. In this case you will need to make your own arrangements for an overnight in Anchorage. Day 01 Fly to Anchorage. Group will meet at 2 p.m. at the Anchorage airport Alaska Airlines baggage carousel and will be transported to Talkeetna. We will stop along the drive to pick up last-minute perishable snack items. Group will spend the night in Talkeetna. 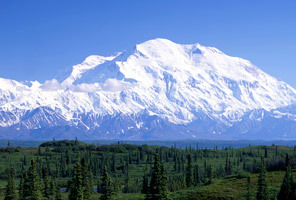 IMG will arrange the shuttle pickup and the group lodging in Talkeetna. Day 02 Day in Talkeetna. We will meet with the NPS for a briefing, go over each individual's personal equipment, familiarize ourselves with the group equipment and divide it and get packed for the trip. Second night in Talkeetna. Day 03 Our scheduled "Expedition Departure Date." Bush pilot will fly us in to Base Camp on the SE Fork of the Kahiltna Glacier at 7,200 feet, a 45 minute flight. It is possible to move this day, or we may sit and wait until the cooler temperatures of evening. Day 04 Load sleds and drag them several miles on the low-angle Kahiltna Glacier to Camp 1 at 8,000'. Day 05 Continue dragging sleds and all equipment up "Ski Hill" to Camp 2 at 9,500'. Camp is just below Kahiltna Pass. Day 06 As group energy permits, we will move up to Camp 3 at 11,000' or do a carry of gear. Day 07 Likely time for first rest day. Day 08 Carry extra gear to 13,500' up around "Windy Corner." Sleds go no higher than 14,000', and are light above 11,000' if used at all. Return to Camp 3. Day 09 Move up to Camp 4 at 14,000'. This is the location of the manned ranger post with medical supplies. Day 10 Drop down to 13,500' to pick up cache. Second night at 14,000'. Day 11 Possible rest day, third night at 14,000'. Day 12 Carry one weeks supply of food and fuel to high camp at 17,200'. Return to 14,000' for fourth night. Day 13 Fifth and final acclimatization day if needed at 14,000'. Day 14 Group moves to high camp at 17,200'. Day 15 Possible rest day at high camp or first summit option. Day 16 Likely summit day. Day 17 Descend to 11,000', Camp 3. Day 18 Descend to Base with pickup by our bush pilot if we are lucky. Day 19 Likely pickup by bush pilot. Return to Talkeetna with option of spending night in Talkeetna or return to Anchorage. This itinerary is approximate. Our rate of ascent will be dictated by the weather, the strength of the group, and our rate of acclimatization. All climbing decisions will be made by the guides, with the best interest of the group as a whole in mind. There will be a cache of food at Base Camp and we will carry 20 days of food with supplements to stretch it to 25 days if necessary. Allow an average of 21 total days for the entire trip, but be flexible enough to extend the trip another 4 or more days if necessary. A perfect weather expedition can take 15 days on the mountain. Average time is perhaps 18 days, and 22-25 days is not unusual. I want to inform you that I really was a bit surprised, that all the logistics and work on the mountain was as perfect as clock work. I thought that with so many people and so much stuff there could be also a small mistake or something, but nothing... all worked really perfect.